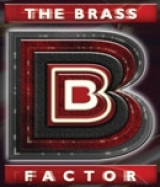 The 2012 Brass Factor competition celebrated being proud to be British and was dedicated to the memory of Private Thomas Wroe, 18, from 3rd Battalion the Yorkshire Regiment, who died in Helmand Province on 15 September, 2012. A collection was made in his honour and the proceeds were donated to the Yorkshire Benevolent Trust. There to provoke the audience into a reaction, the judges; Kevin Wadsworth (executive member of the Association of Brass Band Adjudicators), Gilbert Symmes (presenter and conductor of Community Brass at Oldham Community Radio), David Hoyle (Radio Leeds presenter) and Jon Hammond (BBC television and radio presenter) were an entertainment factor in themselves. The event organiser, Alex Bray said, “2012 has been a vintage year and a fantastic time to be British”. He added, “We have seen medal hauls at the Olympics, the Queen’s Diamond Jubilee and the 50th anniversary of the first James Bond Film”. Six bands went head-to-head and performed very diverse programmes. Putting on a fabulous show and earning extremely positive comments from all four judges, the Skelmanthorpe B Band were awarded second place, beating Emley Band, The Slaithwaite Band and Delph Band, the winning band of the evening being Hade Edge Band. Watch Kirklees TV YouTube clip about the event.